Former school board member Juan ‘Mitch’ Santiago has submitted a letter to municipal officials on Tuesday morning urging them to appoint him to fill outgoing councilman Andre Sayegh’s seat. Sayegh represented the 6th Ward for 10 years. He was elected mayor last week. Sayegh has yet to resign from his council post. He will be sworn in as mayor on Jul. 1, 2018 leaving a vacancy on the council. Santiago ran for one of the three available council at-large seats and finished sixth place last week. “I live in the 6th Ward. I put in a letter of interest. If somebody is interested or is saying they are interested they should have done the same thing,” said Santiago. He has lived on George Street for 10 years. He then moved to Park Avenue only to return to Trenton Avenue. For the past four years, Santiago has been living at an apartment on Trenton Avenue, he said. Council president Ruby Cotton on Tuesday morning said she has yet to see the letter. She said once she sees the letter she will have to have a discussion with her colleagues to see what to do next. Sayegh is expected to favor Abdelaziz, who helped him win the mayor’s seat. “I’m clearly interested in the 6th Ward council seat to continue working on improving the quality of life and the progress that 6th ward has seen. At this time, I will be talking to my family, supporters and 6th Ward residents before we make any decisions,” said Abdelaziz. The council at one point opposed making appointments. 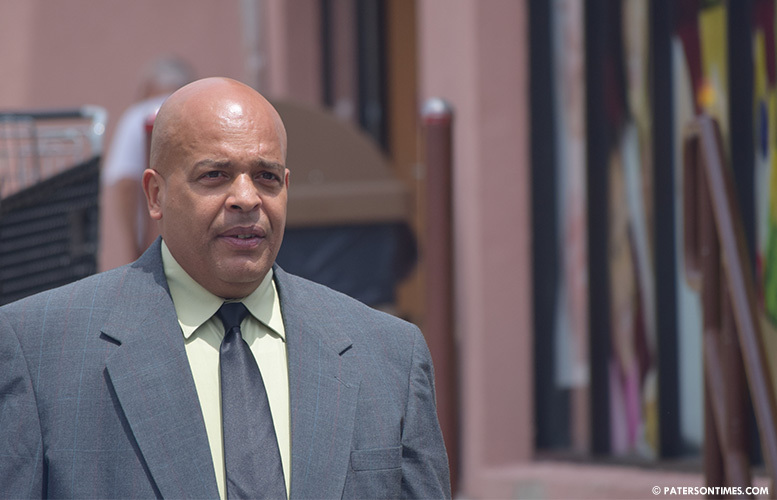 In 2014, council members heeded pastor James Staton’s call to appoint him to fill the vacancy created by the conviction of 1st Ward councilman Anthony Davis. Council members opened up an application process, interviews were conducted, and Staton was appointed in Dec. 2014 to represent the 1st Ward until the Nov. 2015 special election. Voters elected businessman Michael Jackson in Nov. 2015. Santiago is hoping for a similar process to fill the 6th Ward vacancy. Regardless of whether an appointment is made or not, a special election has to be held in November. Santiago is a three-term former school board member. He has been working for the Department of Public Works (DPW) as a supervisor since 1985. He is the brother of public works director Manny Ojeda. Santiago makes $42,842 as a supervisor. “I don’t know who is running,” said Santiago. He said he is the first person to submit a letter expressing interest in the 6th Ward seat. Santiago said two years ago, he was asked to run against Sayegh for the 6th Ward seat. Sayegh and Abdelaziz fought for the 6th Ward seat. Both men have patched up their relationship and have been working together to push for things like the police substation at the South Paterson library. This report was updated at 12:03 p.m.
Santiago didnt do anything for the kids of Paterson as BOE member, why should he be elected councilman? Thanks but no thanks Mitch. Wasn't Al the right hand man for Convicted mayor Torres and plotted to get rid of Sayegh. Now greedy Al wants the 6th Ward seat he jumps from Torres to Sayegh. More Corruption as he is going to be a "yes man" for Sayegh as he was for Torres. How was your election bid? This guy is a nobody he makes fake news . I believe he was behind the racist flyers going around in the mail . I wouldn't put it past this guy. He is evil. I believe the picture on the flyer was one he took of the mayor-elect. And andre is not muslim you idiot . Your a man of stupidity and fake news . I agree, Mr. Omar. This guy is a joke. He is not a respected figure in the community. Don't take him too seriously.